Listen up all you Occupy Wall Street people. 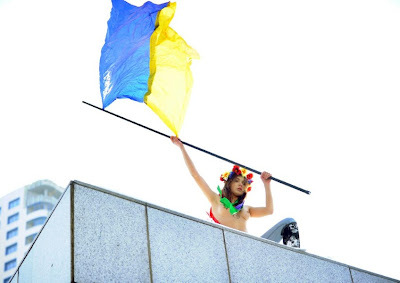 If you really want Wall Street to listen to your demands, you need to follow the example of the Ukrainian female action group "Femen". They are protesting right now in Moscow against the Russian natural gas giant Gazprom. Turns out Gazprom is delaying delivery of gas to the Ukraine and these ladies are none too happy about that. Oh yes, forgot to mention, these ladies are protesting during the day when the average temperature in Moscow is -7.6 degree Fahrenheit (-22 degree Celsius). Talk about dedication!